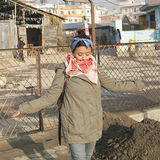 RECONNECTING MEMORIES AROUND THE GLOBE Diana Marcela Torres - student no. 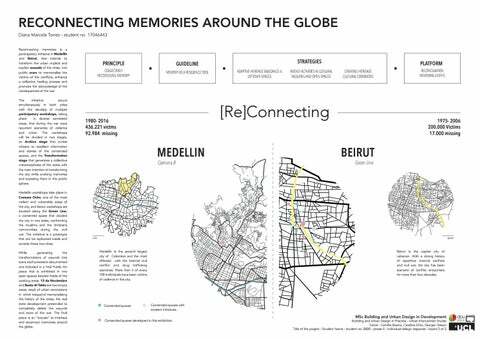 17046443 Reconnecting memories is a participatory initiative in Medellin and Beirut, that intends to transform the urban implicit and explicit wounds of the cities, into public scars to memorialise the victims of the conflicts, enhance a collective healing process and promote the acknowledge of the consequences of the war. The initiative occurs simultaneously in both cities with the develop of multiple participatory workshops, taking place in diverse contested areas, that during the war were recurrent scenarios of violence and crime. The workshops will be divided in two stages, an Archive stage that invites citizens to recollect information and stories of the contended spaces, and the Transformation stage that generates a collective metamorphosis of the areas with the main intention of transforming the city while evoking memories and exposing them in the public sphere. Medellin workshops take place in Comuna Ocho, one of the most violent and vulnerable areas of the city, and Beirut workshops are situated along the Green Line, a contented space that divided the city in two sides, confronting the muslims and the christians communities during the civil war. The initiative is a prototype that can be replicated inside and outside these two cities. While generating the transformations of wounds into scars, each process is documented and included in a final Public Art piece that is exhibited in two open spaces located inside of the working areas. 13 de Noviembre and Basta Al Tahta are two empty areas, result of urban renovations in which instead of memorialising the history of the cities, the real state development pretended to completely delete the wounds and scars of the war. The final piece is an “excuse” to interlace and reconnect memories around the globe. Beirut is the capital city of Lebanon. With a strong history of repetitive internal conflicts and civil war, the city has been scenario of conflict encounters for more than four decades. Medellin is the second largest city of Colombia and the most affected with the internal civil conflict and drug trafficking scenarios. More than 6 of every 100 individuals have been victims of violence in this city. MEMORIAL MUSEUMS The reconnecting memories initiative starts as a contestation of the methodologies that memorial museums are applying in urban centres. These museums concentrate all the evidence of the war in one close space preventing the public exposition of the collective wounds. Cities have been witnesses of violence thus they should be part of the exposition of violence events in order to allow wounds transformedion into scars. understand the value of life and hope. The Reconnecting initiative rebulids an exiting exhibition and extended it into the public space. war that affected the city. The Reconnecting initiative promotes the expansion of the war memory to the public space. MUSEO CASA DE LA MEMORIA Actors involved: Department of Local Governance of Medellin, Department of Culture of Medellin, EDU, Centro Nacional de Memoria Histórica, ITM University, Faculty of Arts and Sociology National University of Colombia, Cultura Diáfora Organisation, Dwellers of Enciso, Limoncito, Los Angeles, Prado y Villa hermosa neighbourhoods, general public. BEIT BEIRUT Actors involved: Governance of Beirut, Beit Beirut organisation, Beirut Art Center, White Wall initiative, Dwellers of central Beirut, & General public. of violence plays a main role. The Reconnecting initiative creates a communal living room with furniture of dwellers’ homes. promotes the representation of damage buildings in the streets, to enhance the acknowledge of the war as a part of the city. LA LADERA PARK Actors involved: Department of Culture of Medellin, Leon de Greiff Public Library, Faculty of Art and Sociology Antioquia University, Dwellers of La Ladera, Sucre, El Pinal, Llanaditas, & La Mansion neighbourhoods, General Public. RAS AL NABA’ A Actors involved: Governance of Beirut, American University of Beirut, White wall initiative, Yazan Halwani: Artist of the “Immeuble Noueiri” piece, Dwellers of the Noueiri building & Al NaBa’a neighbourhood, General public. UVA SOL DE ORIENTE Actors involved: Department of Culture of Medellin, EDU, Sol de oriente organisation, UrbaM-EAFIT University, Propuesta en Aerosol Collective, Dwellers of 13 de Noviembre, La Libertad, San Antonio, & Alejandro Echavarria neighbourhoods, General public. Reconnecting initiative promotes the creation of a public site in a abandon area, due to the lack of open spaces in the city centre. BACHOURA Actors involved: Governance of Beirut, American University of Beirut, 1 kg of Separation initiative, White Wall initiative, Beirut Digital District organisation, Built by Associative Data in Beirut, Dwellers of central Beirut, & General public. For the second stage of the workshops, there is an open invitation for all the previous participants to actively engage in the transformation of every site. Actors involved: Governance of Beirut, Beit Beirut organisation, Beirut Art Center; Department of Culture of Medellin, EDU, Centro Nacional de Memoria Histórica, general public. globe, the final outcome of the workshops are collected in an open space exhibition in both Medellin and Beirut. 13 DE NOVIEMBRE PLAZA A public space connected to the green Belt of Medellin, 13 de Noviembre was the scenario of the signature of the manifest for life, a document to promote a non violence and peaceful coexistence in Comuna 8. BASTA AL TAHT A Central neighbourhood of Beirut with high demand of real state renovation. Located next to Bachoura and Nasrah, Basta Al Tah was one of the Muslims fronts of the civil war and as a consequence it has a high amount of buildings affected during the war.